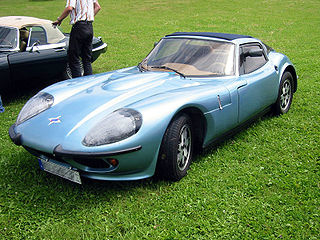 The Marcos sports car. 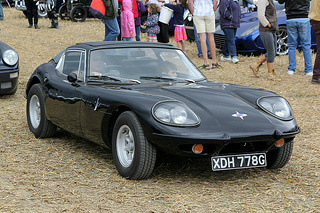 The company was founded in North Wales in 1959, and its first sports car, called the Xylon, had gullwing doors, a high roof, and a split windscreen. It was given the nickname "Ugly Duckling", and was powered by Ford 1 litre and 1.2 litre engines. Targeted at competition events, only nine were built between 1959 and 1960. Production models were built up to 1963. It achieved racing success when driven by Jackie Stewart, and others. In 1961, there were design changes to the original car, making it sleeker and more attractive. 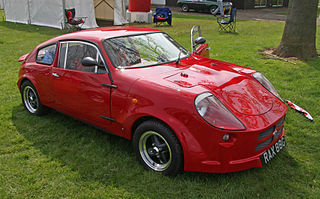 The plywood chassis and gullwing doors were kept, and the car was now renamed the Marcos Luton Gullwing sports car. A total of thirteen were built. It was mostly used for racing. A convertible version, known as the Spyder, was launched with the gullwing doors removed. 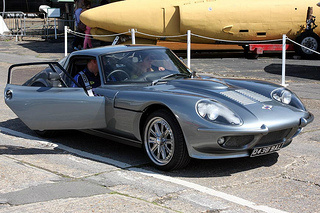 In 1964, the Marcos GT 1800 sports car made its debut at the London Racing Car Show. Presented as a road car, it was well received. It retained a wooden chassis, which was encased in a glass fibre shell. It originally used a 1.8 litre, 4-cylinder, Volvo engine. However, in 1966, this was replaced by a range of Ford engines, from 1.5 to 1.65 litres. Finally, in 1969, a Ford V4 unit was used. In 1969, the plywood chassis was replaced with one made of steel. This allowed more powerful engines to be used, such as the 3 litre, Ford V6, or the 3 litre, Volvo straight 6-cylinder. Cars exported to the US used the Volvo engine to cover exhaust emission regulations. In 1965, the Mini Marcos sports car was launched. It had a glass fibre body, and used the sub frame and A-Series transverse engine from the Mini to produce an affordable sports car. It was successful on the race circuits, and was the sole British entry to finish the 1966 Le Mans race. 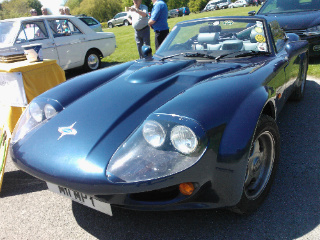 It was sold as both a production and kit car. 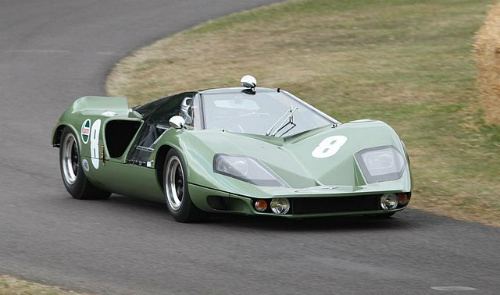 In 1968, the Marcos Mantis XP was introduced. It was, in fact, a racing car powered by a mid engine BRM V8. Only one car was made. In 1970, the Marcos Mantis M70 sports car was launched. It was a 2+2 sports car powered by a 2.5 litre, fuel injected, 6-cylinder, Triumph TR6 engine. The luxurious interior seated four in comfort. Marcos went into receivership in 1972. In 1981, Marcos re-emerged from receivership. 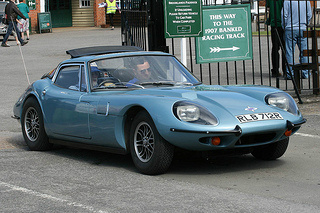 Since 1964, the Marcos GT 1800 sports car was marketed in kit form. 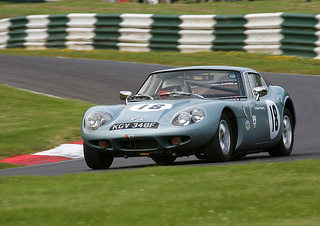 A range of engines was available, including the Ford 3 litre V6, 2.8 litre V6 and 2 litre V4, as well as the Triumph 2 litre, and 2.5 litre, straight six. Up to 1989, there were about 130 kits sold. In 1983, the Marcos Mantula sports car was launched. 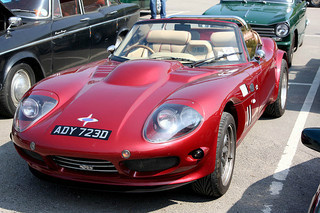 It was based on the Marcos 1800 GT from 1964, but with a body desighed to be more aerodynamic. It was powered by the more powerful and lighter Rover 3.5 litre V8 engine. 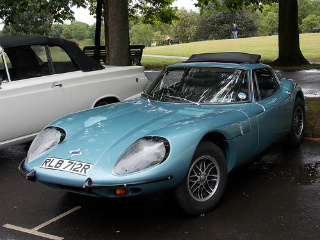 Its light weight made it a match for other Rover V8 powered cars, such as the TVR and Morgan. Later Mantulas were powered by the Rover 3.9 litre engine. 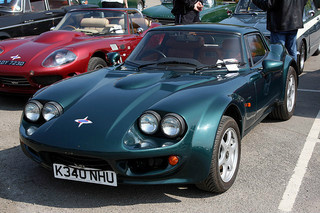 In 1986, a convertible version, called the Marcos Spyder, was introduced, powered by the Rover 3.5 litre V8 engine. It would eventually outsell the coupe versions. Some 170 coupes and 119 Spyders were built. In 1991, the Marcos Martina was launched. 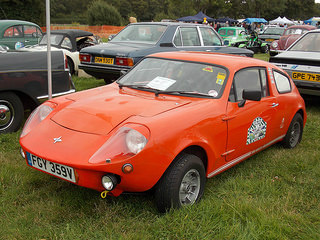 Looking very similar to the Mantula, it was a lower cost version, and used the Ford Cortina, 2 litre, 4-cylinder engine. Nearly all were kit cars. Some 80 Martinas were built. In 1992, Marcos decided to leave the kit car market. That same year, the Marcos Mantara sports car was launched. 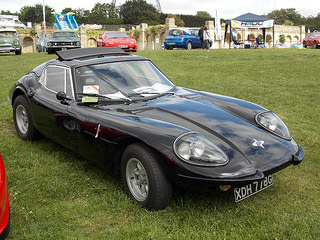 It was powered by a 3.9 litre, Rover V8 engine, although a 4.6 litre unit was offered as an option. There was little difference between the Mantara and Mantula. Road going LM cars built numbered about 30. In 1997, the Marcos Mantis sports car was launched. It was offered as a two seat convertible, and a fixed head coupe based on the LM series of Mantaras. 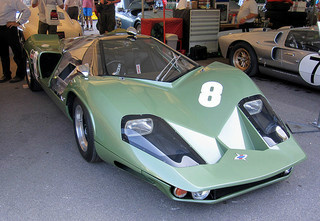 The Mantis was powered by the four cam, V8, Ford Cobra engine, developing 370 bhp. In 1999, a 500 bhp supercharged version became available. 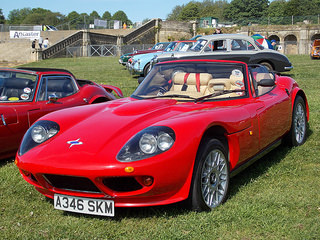 The Marcos GTS, a version of the Mantis, introduced in 1997, was powered by a 2 litre, Rover engine. 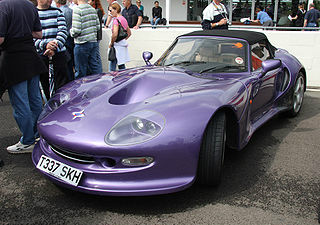 An alternative version of the GTS was the Marcos GTS Turbo, of which only one was built in 1997. 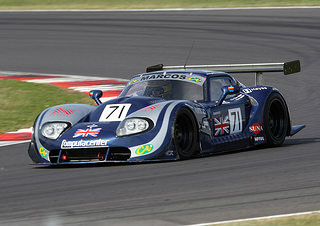 In 1998, the Marcos GTS was further developed to produce the Marcos Mantaray. It was powered by one of three Rover options: 2 litre, and 4 litre or 4.6 litre V8 units. Only 17 were ever built. In 2004, the Marcos TSO was launched, powered by a Chevrolet 5.7 litre V8 engine, as used in the Corvette, which developed either 350 bhp or 400 bhp, depending on tuning. Although it was marketed solely for the Australian market, in 2005, the GT2 variant was introduced for the European market. 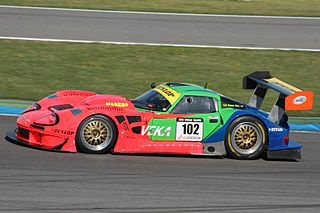 In 2006, the Marcos TSO GTC was introduced in which competition suspension and brakes plus a rear diffuser were added to the original TSO. The Chevrolet V8 engine now developed 420 bhp, but when the Performance Pack was added, the output increased to 462 bhp. This modification produced a top speed of 185 mph, 0-60 mph in 4.1 secs, 0-100 in 8.5 secs, and 0-100-0 mph in 12.9 secs. Unfortunately, only 7 units of the TSO were ever built prior to the company, for the last time, going into receivership. Got any stories about Your Favourite Marcos Sports Car?